With Commander Miles Unum taking a Leave of Absence due to a career change, the USS Mercury now has a new commanding officer. Commander Aron Kells has reported for duty! Tony, the writer behind Aron Kells, is no stranger to Starbase 118. Graduating from the academy back in 2005 with the character Lily Ventu, he was first assigned to the USS Victory as a Counselor. When asked about his time on the Victory he stated, “The ship was running a mission that didn’t have much to do with the counseling department and so I was a pretty inconsistent simmer. Nevertheless, when I finished the mission strongly, I was promoted.” Lily Ventu remained in service for quite some time. She made it to the rank of Lieutenant Commander on the Victory and remained in her role until her decommissioning in 2007. 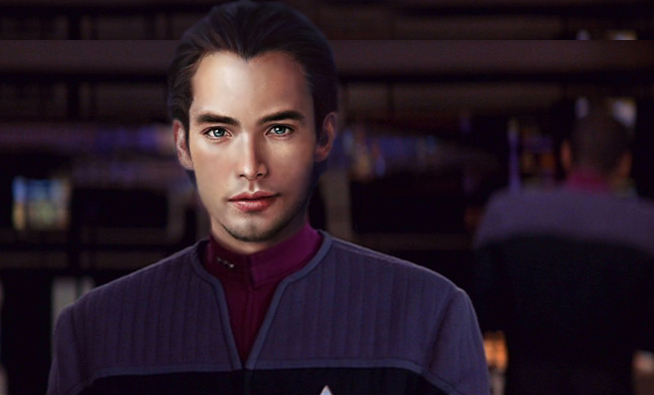 Soon after that mission, Aron Kells was given the rank of full Commander, a rank that Tony had achieved with Lily Ventu. His time on the Drake would soon come to an end as he transferred to Starbase 118 Operations as the new First Officer under Commander Kalianna Nicholotti. No stranger to command, having once commanded Starbase 118 Operations, he quickly jumped in to the role of First Officer. It was a role that he would hold for only a short period of time. Soon after his move to Ops, an opportunity came up that sent Commander Aron Kells to the Menthar Corridor, near the Cardassian border, to take command of the USS Mercury. We would like to wish our new CO smooth sailing as he ventures out into vast openness of space, a place where many of us call our home away from home. With all that he has learned, he will begin the road to making the rank of Captain. With a strong crew and a great ship, there is no doubt he will soon reach his goal. When you spot Tony around the fleet, be sure to congratulate him. Be sure to follow Commander Kells and the rest of the Mercury crew on their Yahoo! Group.